The other day after I talked about my adventures in that rainstorm, people kept getting in touch with me on Facebook saying they thought St. Christopher, above, was no longer a saint. What do they think he is, the guy on the next barstool? Do they think he lies around on the couch, like Ron Moss? I did some research because as long as St. Christopher had come through for me I thought I should come through for him. And here is what I have found. A while ago the Catholic Church looked into which saints had basis mostly in legend, and St. Christopher was found to be one. So his feast day was taken off the universal calendar. I imagine the church biggies have to be sticklers for stuff like this because it has to be clear that saints are matters of actual fact. But although St. Christopher is off the official calendar, localities are free to include him on their calendars, and belief in St. Christopher is allowed and encouraged. You can read the Catholic take on St. Christopher here. No. 1, if he were not a saint, St. Christopher's Church on Niagara Falls Boulevard would have to be renamed. And that is a big church so you would hear about it. Remember when Jim Kelly got married there? My brother George and I were laughing because we loved imagining everyone in that big stylish football wedding having to deal with all that Niagara Falls Boulevard traffic. No. 2, if St. Christopher was not a saint, not only would St. Christopher's Church have to be renamed but Fourteen Holy Helpers would have to become Thirteen Holy Helpers. 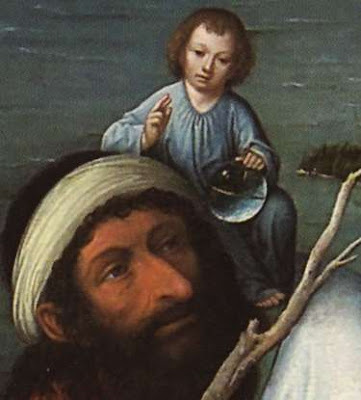 St. Christopher is one of the Fourteen Holy Helpers! Note to out-of-towners: This is a Buffalo thing. There is a Fourteen Holy Helpers parish in Gardenville. In school, whenever we heard their name on the loudspeaker, we would crack up. There were two schools that would crack us up. Fourteen Holy Helpers was one and the other was Precious Blood. I never knew who the Fourteen Holy Helpers were but now I have found out. They are saints with practical uses who were especially big in German-speaking countries. The devotion to them apparently began in the Rhineland in the 14th century during the time of the Black Death. Hence the Fourteen Holy Helpers church in a part of Buffalo settled by Germans. Saint Christopher and Saint Giles were invoked against the plague itself. Saint Denis was prayed to for relief from headache, Saint Blaise for ills of the throat, Saint Elmo, for abdominal maladies, Saint Barbara for fever, and Saint Vitus against epilepsy. Saint Pantaleon was the patron of physicians, Saint Cyriacus invoked against temptation on the deathbed, and Saints Christopher, Barbara, and Catherine for protection against a sudden and unprovided-for death. Saint Giles was prayed to for a good confession, and Saint Eustace as healer of family troubles. Domestic animals were also attacked by the plague, and so Saints George, Elmo, Pantaleon, and Vitus were invoked for their protection. Saint Margaret of Antioch is the patron of safe childbirth. And this is the best! There are no other Fourteen Holy Helpers churches anywhere in the United States! I Googled Fourteen Holy Helpers and ours is the only one that comes up. They have Fourteen Holy Helpers churches in Germany, Austria, Italy and Hungary but none other one here. That is good. Here in Buffalo we can use all the holy help we can get. I personally could use a patron saint of biographers to get me through my book on Leonard Pennario. That would sure be useful. Here is one more thing in case anyone still doubts that St. Christopher is real and that he is actively involved in getting us safely to work and back. The day he got me through that storm, that was his feast day! Here I was writing about it, and I had no idea. How big a coincidence is that? No wonder he was right there! Too bad that you didn't give the German name: Wallfahrtskirche Vierzehnheiligen. If I can go by the name, it was a pilgrimage church and when 14 HH was first formed in Gardenville, way out in the country, I'll bet it was regarded as a pilgrimage stop in America. Okay, so St. Christopher is still a real saint, but I have a hard time believing that Gardenville is a real place. Does anyone really still refer to this area as Gardenville, other than Fourteen Holy Helpers Church? Do people say, "I took a ride out to Gardenville the other day to..."? I like the idea of having a patron saint to deal with the temptaions of the deathbed. The whole notion of that fascinates me. My current favorite saint is St. Dymphna.